15' inflatable Kayak & inflatable Boat crossover - KaBoat SK470. This new and revolutionary product, is a crossover between an inflatable kayak and an inflatable boat – KaBoat! It can be used as a regular kayak, just paddling anywhere you want, ocean, bay, river or lake. If you get tired, use an electric or gas engine installed on marine grade plywood transom. The 15' SK470 provides more space and comfort compare to popular SK430 model, due to the larger distances between aluminum seats and extra space in the front bow. 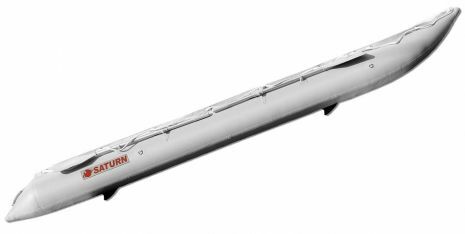 Longer tubes of SK470 also provides higher buoyancy for more cargo and passengers.Use the KaBoat as an inflatable motor boat with an outboard engine. It can take up to a 10 HP gas outboard engine or portable electric trolling motor. The KaBoat is extremely portable and will fit in medium size bag. Now you can go on vacation and take the KaBoat with you along with an optional small electric or gas engine. Set of rowing oars with 2 sets of oar locks for tandem rowing. Included: 1 aluminum bench, hand pump, repair kit, rowing oars and carry bag. Love the Kaboat. It doesn't require a lot of horsepower to cut through the water with ease. This fits in the back of a sedan so if you don't have much space and want to own a boat, go for the Kaboat. I purchased the SK470R and love it. The boat is better quality than expected and is great since I live in a small apartment. Set up time from the back of my sedan to water is about 5 minutes, I can often set it up and be out in the water before larger solid-hull boats can get off of their trailers and going. With my small outboard this things zips and since it doesn't weigh much at all, I barely use a gallon of gas all day. Anyways it's a fantastic boat that I can afford on a college budget. The SK470 was everything I could have imagined in a quality boat, and more. I've taken it to 5 different lakes so far, and the performance of the boat has surprised me and those around every time. We even sat 3 adults comfortably on the boat in a lake for an hour, without leaving a scratch on the kaboat. After receiving this boat and taking it out, it has turned fishing into a fully fledged hobby! I gave this boat 4/5 stars because there are some minor quality improvements to be made, although I’m very happy with the product overall - especially the performance and price. On the quality: I noticed three things once I got the boat 1) the aluminum seats are a bit too long and so they slip out of the grommets once the boat is inflated if you try to carry it around 2) one of the tube air valves is installed very low to the floor and so it is difficult to connect the hose and top off the pressure 3) the drain valve was sealed using clear RTV silicone, which does not stick to the plastic or wood hardly at all. I peeled this off, sanded , and sealed the area using 3M 5200 so that the transom wood doesnt rot out from moisture. Overall, the PVC materials are thick enough and have been durable while dragging the boat over rocks and logs. On the performance: I’ve used my SK470 with a 6hp Tohatsu - it pushes the boat and a 220 lb load to 16.5 MPH. One thing to note is you MUST place the weight in the middle of the boat for proper performance and stability. I use a 3 ft tiller extension made from 1.5” PVC with 4 slots cut in the end to form a collet. It’s held in place with two hose clamps and works great. If you sit in the middle of the boat then there is no on-plane/off-plane sensation. You can travel at any speed and the boat simply stays flat and rises slightly higher out of the water as it goes faster. It cruises well at any speed and so even a 2.5 hp engine would push this boat along nicely - something not possible with wide boats due to the extra form drag. If you drive from the back seat then the boat performs poorly and I assume that’s why some other reviews mention poor stability. If all the weight is at the stern then the bow rises into the air and the boat has a definite planing speed of about 11-12 MPH and it is WAY less stable between 5 and 11 MPH since the bow is just pointing into the air. Even when on plane it would be easy to flip the boat if you steered sharply and had your weight at the very back end, but this isn’t a problem when the boat is balanced. At rest, the boat is FAR more stable than a canoe since the straight sides place more boyancy at the edges. I usually just sit on one tube whether traveling or still and don’t feel like it’s ever going to tip over. Also, the boat is light enough for me to lift and launch or retrieve alone. Overall, excellent performance. I am enjoying this boat and think it’s an excellent way for one person to get out on the water and explore remote areas. I haven’t had a passenger yet, but don’t foresee any issues. My weight barely sinks the boat down, so it should easily handle all the load you can fit inside. Overall, a good product and a great value. Glad I found BoatsToGo to buy a KaBoat. It was easy to order from, had a great price, and the boat arrived just as expected. I ordered a SK470 and couldn’t be happier. The boat inflates easily and is stable and rugged. I’m able to put it right on top of my car to even make things more convenient. I’ve used a 4.5hp on it and it works good, I plan on putting an 8hp on it next and should work even better. I’ll be ordering other things I’m sure. Your boats are GREAT - making 10 mph (controlled by Garmin GPS) with 2 peoples on 2.5HP Suzuki outboard! I got an Sk470 15' Kaboat a couple of months ago. This is my first and only inflatable boat, primarily to be used for fun around the harbor in my town on Long Island. Since it is my first and only boat, I had a bit of a learning curve. I quickly learned that boats are not the water equivalent of cars. Many more dynamics requiring many more considerations. First the good news. Although I had only internet photos and info to base my decision on, my choice of the Saturn brand was either smart or lucky. I live in a town with lots of inflatable moored at the dock which gave me plenty to compare to, at least visually and on a tactile basis. I could see and touch lots of brands up close, and although this is new to me, quality seems to be fairly easy to determine with careful comparison. In the Saturn price range, the only brand that seemed to be a possible contender were some of the Sea Eagle models. I came close to a Sea Eagle purchase since they are produced close to my town. However, they seem to be quite limited in their retail showroom hours, so I would have ended up buying sight unseen anyway. That put me back on the internet sales route, and after receiving my Saturn and comparing it to the Sea Eagle models I've seen locally I'm glad I went with the Saturn. The Sea Eagle's look OK, but they have the look and feel of high quality toys rather that actual boats. I'm not knocking their brand, and they may have models that are more substantial that the ones I've seen. My Saturn inflatable boat seems to be on quality par with brands like Zodiac and some of the other more high end inflatable boats brands. I continue to be very impressed with both the quality of materials used and the quality of build in my boat. It may be PVC, but the quality seems comparable to some of the Hypalon boats I've seen up close. I am very satisfied with the quality of my Saturn boat. 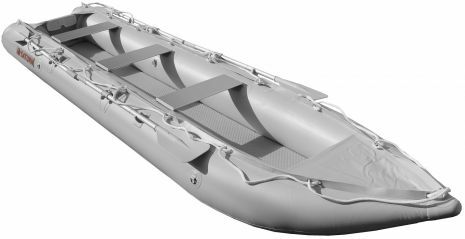 I chose the KaBoat Sk470 15' over the more traditional inflatable boats models for a couple of reasons. First of all, $699. for a 15' boat seemed like a hell of a lot of boat for the money, and second, my reasoning was that such a narrow beam would cut through the water more efficiently than a full beam width craft. On the face of it, my reasoning seemed to make sense; at least to someone with no boating experience. The realities were a little different than I had expected. I still think it's a lot of boat for the money, and it does move a lot faster than a standard width boat with the same size engine. I learned very quickly that a boat isn't a car on the water. With a Tohatsu 6hp outboard and 2 people, I would guess I'm moving along at close to 20 mph. Just a guess, but I can tell you it moves pretty good. Even with 3 people it moves right along, I'd guess maybe 12 mph or so. Now, I also have a 2hp Tohatsu I've used on this boat, and while it goes a lot slower, it seems to be much easier to control. I do love this boat. I love the quality, and although if I were to start over, I would pick a different Saturn model, I am determined to sort out the control issues and come up with a fix. Weight distribution is certainly a factor, as is keeping a low center of gravity. I may end up sacrificing some performance and rigging up some form of outrigger or outside tube to give it a wider beam. 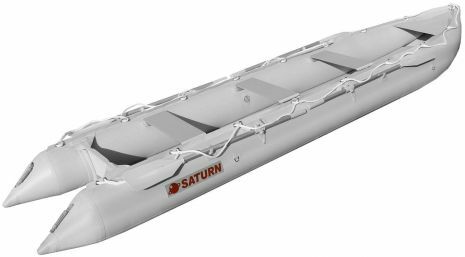 Bottom line on Saturn boats from my experience. Quality is better than I expected, on par with some much more expensive inflatables I've seen. The KaBoat is a different animal, but my experience with the 15' model may be quite different with the smaller size models. I love it and I get a lot of complements on it. Good Luck! We've had lots of boats - sea kayaks, Zodiacs, canoes, fishing boats, etc. The Kaboat really is an inflatable square-stern canoe and does that job very well. We've had ours for 2 years now and like it more every time we use it. The Kaboat is a great all around "camping boat" that can do most anything well. It's very stable and safe and handles very well for an inflatable. The quality of construction is surprisingly good - at least on par with our French made Zodiac. The high pressure air floor is very rigid like the top brands of inflatables. We mostly use canoe paddles and it will do about 2.5 mph which is decent for an inflatable. Paddling in the kneeling position would be faster. Thinner paddlers will also achieve higher speeds. We can also use it with our electric motor or our 2.5 hp Suzuki which is a nice option to have. It steers amazingly well for an inflatable and it's many times more stable than a regular canoe. We mount our fish finder transducer on the wood transom which works great. We also made a "saddle" for the anchor rope so we can pull it up without reaching out over the side. The Kaboat will row fairly fast (maybe 4 mph?) but you can not really row it sitting on the seat because your knees will get in the way. It's better to kneel for rowing. Kayak paddles can be used but, being a wider boat, they are not ideal for it. There is a ton of buoyancy so you can put as much as you want in this boat. If you lock the valves in the open position you can fill it up quickly with an inexpensive low pressure inflator. Then close the valves and top it off with the "T" pump. Takes barely 10 minutes this way. We are totally happy with this boat. It's very versatile, very well made (especially for the price) and a great design. I do not think there is a better all around inflatable boat. It's the ultimate camping boat.